Visit Wat Arun & Wat Pho at night. Wander around the famous Flower Market. Stop at a local food market. Explore the ancient and modern history of Thailand with a 3-day trip from Bangkok, taking in Kanchanaburi and Ayutthaya. Uncover a golden age of Siam with the royal residences and atmospheric temples of ancient Ayutthaya. Swim in idyllic rock pools fed by waterfalls in the seven-tiered Erawan National Park. Do you love Thai food? Do you want to learn how to make some of your favourite dishes? Do you want to give back to the local community during your stay in Bangkok? If so, this tour is for you! We’ll shop for the ingredients at our favourite market before heading back home to cook three tasty treats with the help of Courageous Kitchen, an inspiring non-profit organisation that encourages community leadership through the power of food!. Cycle through an undiscovered and non-touristy part of Bangkok. Make a trip with a traditional Thai longtail boat through the canals. 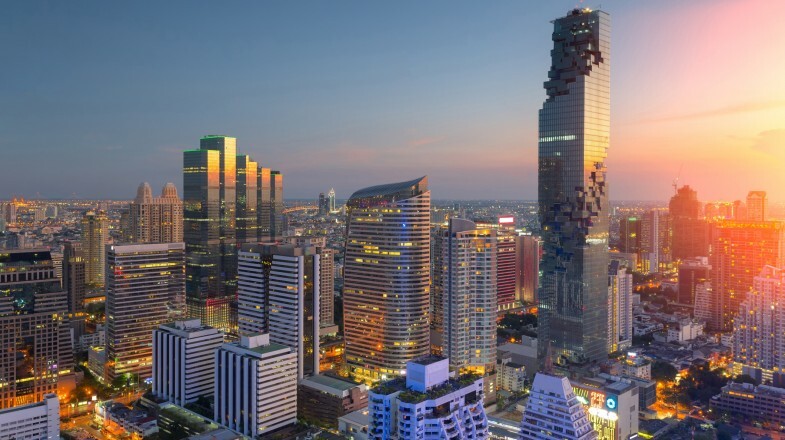 Home to some 11 million people, bustling Bangkok can often seem chaotic and intimidating to a first-time visitor but don’t be put-off. Once you delve into the life of the city, you’ll discover curious markets, enduring canals and reverent temples wrapped up into surprisingly cosmopolitan way of life. The more you explore Bangkok, the more you’ll come to love the mix and match style of this ‘City of Angels’. Visit the Wat Arun, the iconic Buddhist temple, which is pictured on Thai currency. Found on the Chao Phraya River and facing the Grand Palace, climb its main spire and look-out over Bangkok. Wat Arun means ‘Temple of Dawn,’ so visit at sunrise for the best view. If you need something, anything, while in Bangkok, head to the Chatuchak Weekend Market. This is souvenir shopping on another level. Khao San Road is a backpackers paradise. You’ll find travellers galore here and so it’s a great place for nightlife, food, shopping and meeting people. Watch a show at the trendy Patravadi theatre. Performances include theatre and dance as well as acrobatics and musical shows. The Rot Fai night market is made for vintage lovers. Selling antiques, vintage clothing and memorabilia, spend an evening perusing unusual finds. Visit one of Bangkok’s uncountable malls for the decor as well as the well-priced goods. Terminal 21 is especially known for its gorgeous interiors. Bangkok has a hot, humid climate. Make sure you drink plenty of water while you’re running around the city sightseeing. While it’s always nice to be friendly, be vigilant on the streets and politely decline help from the locals if you are uncomfortable. Bangkok is a big city, plan ahead when it comes to transport. Don’t take a taxi in rush-hour traffic. If you do take a taxi, make sure the meter is running. Carrying ID is expected in Thailand. Carry a copy of your passport just in case. Save money on food by eating from the local street-stalls. Maybe fried cockroach for dinner? Bangkok is famous for its amazing rooftop bars - check some of the best ones out here.